2013 has brought with it a lot of things, both good and bad. But in this particular post I’ll be focusing on the film-related highlights that I’ve experienced over the past twelve months, from a mini adventure in London that included my first ever podcast appearance to a wine-soaked preview screening of Gravity at the newly converted IMAX cinema in Glasgow. I’ve interviewed idols, attended film festivals, and even walked a red carpet. The year kicked off in style with a five-day long adventure to London for the UK Cinema Showcase. The thought of being holed up in a cinema for ten hours a day may not appeal to everyone, but it proved to be the start to the year I needed. I saw a range of films – from the brilliant (Zero Dark Thirty) to the dull (A Late Quartet) – and spent some time conversing with fellow film fans. It was extremely pleasant and rekindled my affection toward the busting, open-all-hours-except-on-a-Sunday city of London. January quickly slipped into February with an Arnold Schwarzenegger shoot ‘em up and Nicholas Hoult zombie rom-com, and before long it was time for the Glasgow Film Festival. The film were, on a whole, pretty decent (Compliance and Shell, in particular), but the stand out moments were two of the biggest interviews of my life: one with Gemma Arterton (say what you want about her acting, but she’s incredibly charming) and the other with none other than Joss Whedon. It was a manic, yet stupidly exciting couple of weeks. But as March rolled in April and April become May, things quickly settled down into a steady stream of preview screenings and two weekly FDA film events labelled Scottish Press Days (my personal life, however, was on a constant, alcohol-soaked high). One particular high point came with an early May screening of I’m So Excited that included an interview with Pedro Almodóvar, possibly my favourite ever film director. It was also an achievement to have my review of the film featured on the UK quad. June brought with it the Edinburgh Film Festival. 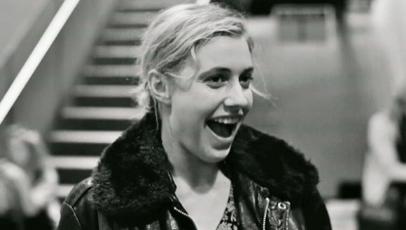 I didn’t see as much as I’d hoped, but there were some films I did catch that have since made there way onto my top ten films of the year list, including Sarah Polley’s mesmerising family documentary Stories We Tell and Noah Baumbach’s spectacular black-and-white comedy Frances Ha. I was also lucky enough to interview Baumbach, whose films I’ve been a fan of for as long as I can remember. He was an absolute delight to interview, and left my smiling from ear to ear. It wouldn’t be a film festival without some parties, and the Edinburgh Film Festival had its fair share of shindigs, and to be able to share these with someone very special – and a never-ending supply of delicious cocktails – made them all the more pleasurable. I only wish I’d plucked up the courage to speak to Felicity Jones before she’d been whisked off by some total stranger never to be seen again. One day, Felicity, one day! The next few months were relatively quiet, though the films became more and more memorable. The Heat, with its Sandra Bullock and Melissa McCarthy double-team, was laugh-out-loud funny, while The Way Way Back proved to be this year’s equivalent of Ruby Sparks, a kind of warm-hearted treat that touches on some fairly weighty issues, but in a way that makes you smile in a cheesy, life-affirming sort of way. In A World… and Blue Jasmine, too, are worth mention for their respective brilliance. October brought with it a preview screening of Gravity at Cineworld’s shiny new IMAX cinema in Glasgow (a glorious, technically out-of-this-world film that deserves to be seen on the biggest screen possible). The night was brilliant, complete with science-themed pre-film fun and the best sparkling rose I’ve ever tasted. But it was November that left the biggest mark. After plaguing them with emails, I was finally granted the opportunity to write for The Guardian. It was a massive achievement for me – certainly not one I’ll be forgetting anytime soon. And that, my loyal readers, brings us to the end of 2013, a mightily fine year for films, film events and my own personal film-related achievements. My blog is continuing to gather momentum, and it’s lovely to have these unexpected opportunities and invites come along that allow me to experience something different every now and again. But it’s not all about the glitz and glamour. The film themselves more than held up their end of the bargain. And, despite the absence of a film like Pitch Perfect, 2013 was pretty darn awesome. If you haven’t had enough of my ramblings, then I’ll be posting my Top Ten Films of 2013 and my Worst Ten Films of 2013 lists in the New Year. Thank you for reading, and here’s to 2014.